Since I entered my role as CEO at The Network, I’ve been doing a lot of studying, observing, and reflecting, on the kinds of trainings and programming we provide, the aims of the programming, the tools we use, and the outcomes we attain. We do some great things. There are also some major gaps. In 2015, we’re working on addressing some of those (we have a really great new board member who’s doing some amazing stuff to build up our social and support groups, for instance), and they teach us (and I mean us, not our straight allies) a lot about how to think critically about LGBTQIA+ challenges in 2015. 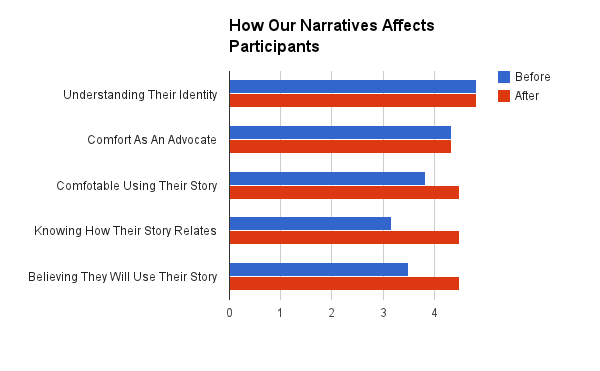 One new program we created is called Our Narratives – it’s the beginnings of an educational arm of the Network built around the idea that identity ownership is pivotal to the LGBTQIA+ struggle. We started with a first program based around the premise that our identity stories, or narratives, are one of the most powerful tools we have in advocating for change. Change could be big – changing the law or the policy of a large national or multi-national organization. It could be small – getting that one person in your class to actually get to know their queer peer instead of just making fun of her. That first event really overwhelmed us with just how powerful these stories are. My Teri, who led the facilitator group (while I hostessed), wrote about his experience of the event. Our outcomes data also showed that our people who did the program came in knowing who they were, but they didn’t understand how their own experiences related to the struggles of others (like an LGBT youth who is homeless, because he’s gay, may not know that 40% of homeless youth nationally are LGBTQIA+, and in Michigan, the number is more like 50%, even though probably only about 3-5% of people are LGBTQIA+). And they didn’t feel like they could relate their narratives to this broader story and use the combination to advocate for change. But Our Narratives impacted that. Our data suggests this is a trajectory alternating intervention – we are creating, together, an army of self-advocates and activists (apropos of that Smiths song, you don’t need an acoustic guitar, and what some activists look like might just surprise you*). But you know me – I just get radicaler and radicaler**. So two conversations sort of reached a confluence in what we’re doing next, at the end of January. First, we had a number of straight allies who wanted to be a part of Our Narratives. This brought up a lot of touchy conversations. And some boorish behavior – like straight allies who wanted us to stop our conversations and explain readily google-able terms***, like “cisgender.” But, ultimately, also, a respect on both “sides” that we needed to start with a space that was completely safe for LGBT people to tell stories about being LGBT people. Also, there’s this thing. We don’t disrespect the fact that our allies put themselves on the line in being our allies. But you would have limited patience for me (this is the relevant forewarning) if I advocated for change based on how difficult my path is being friends and allies with, say, black women. You might even find that offensive – not that it mightn’t be hard, occasionally, politically, for me to be friends with people who are marginalized, or cost me a couple of invitations to tea**** – but seriously, I ought to get over myself on that count pretty readily, and that story wouldn’t really move you to action. So if we want straight allies to participate in Our Narratives, we can teach them the general concept of using one’s own narrative to advocate for change, but we really can’t justify our space being co-opted for some purpose other than telling stories that center on the lived experience of LGBT people. That’s because The Network, and spaces like it, are by, of, and for LGBT people. And straight people, who feel like they don’t have a space of their own, should look, at, seriously, the world. That’s your space. It’s all yours – and in contrast, we’re the ones who frequently lack safe spaces. The second conversation was starting to get constructive about what being an ally means. And for that, I’m going to need a diagram*****. The solid lines mean that the group (in grey) serves to strengthen the system (in color). The dotted lines means the group serves to undermine the system. This is actually a really general concept, this business of what an ally is and should be. We live amidst Systems of Oppression – the patriarchy (or the heteropatriarchy or the cispatriarchy, if you prefer) is one, but just one. A System of Oppression is a process that keeps people marginalized. Notice, she said process. Not a person. Not a group of people. It’s a process. I purposely made all the groups of people in my version of this model grey. Because patriarchy is not synonymous with men. Heterosexism is not synonymous with straight people. White privilege is not synonymous with white people. However, all people – all people, and this is the radical part of the message – play, in any given situation, one of four roles (the names of the roles are negotiable, but not really the point – as my behaviorist friends taught me, it’s the function of the behavior and not the topography) in a system of oppression. 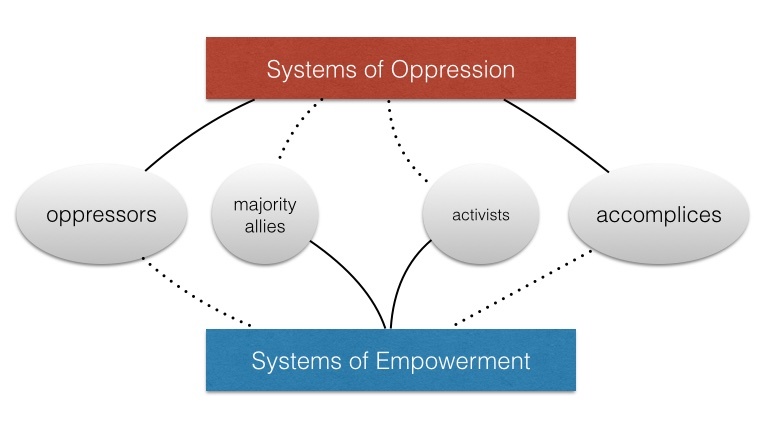 They are oppressors, meaning they are in the advantaged group, and their actions maintain the system of oppression and frustrate the empowerment of the marginalized community. They are accomplices, meaning they are in the marginalized group, but their actions nonetheless help the oppressors maintain oppression and frustrate empowerment. Or they’re activists, meaning members of a marginalized community whose actions break down oppression and build empowerment. Or, finally, and this is the point that’s relevant to this story, they’re allies, who are members of an advantaged group who help activists break down oppression and build empowerment. It’s very important, however, that this concept cannot be explained by breaking people down into less than four groups. The role of an activist and the role of an ally is not the same role. Also, again, taking a cue from my behaviorist friends, in this model, a person being an ally is defined based on the function of their behavior – not what it looks like, and particularly, not just calling themselves an “ally.” You don’t get to call yourself an ally. You get to act like an ally, and we’ll call you an ally when we (that is, assuming, I am we) see it. And when you call yourself an ally, but your actions maintain oppression or marginalization, you’re not an ally. You’re functioning as an oppressor, whether you like it, or not. Again, this model is broad. It applies to you, if you want to be my ally in trans empowerment, whether you are trans or not. It applies to me, when I’m allying with impoverished people as an affluent person. It applies to gay people who are allies in empowering the bisexual or pansexual communities. It breaks down the binary****** that classifies people as LGBTQIA+ or as straight allies, and instead, points out that, dynamically, we all play all four roles in this diagram, at different times and in the contexts of different systems of oppression. And this is the part where it gets radicaler, yet. One of the things we want to confront with this workshop is that LGBTQIA+ people, all too often, make terrible allies. Lesbians and gay men make terrible allies to trans people, sometimes. Trans women make terrible allies to trans men and genderqueer / gender fluid / non-binary people, sometimes. The whole LGBT make pretty terrible allies to the asexual/aromantic community, rather frequently. And we end up in adversarial relations that push us into being bad allies to marginalized ethnic communities, too. So this isn’t (just) a workshop that is designed to make better allies (to the LGBTQIA+ community) out of straight people. It’s a workshop designed to help us all be better allies, and to help us all understand that, by exposing the dynamical process above, we can learn to be critical about when we are being an ally, and when we are being an oppressor. Then, we have a choice. We can get defensive, and keep yelling over the voices of the oppressed, that we are their “allies,” or we can accept the problem, and we can correct it. And you don’t need a footnote to know which answer I think we should be adopting. So that’s the intro to what we’re up to next. If you’re in Grand Rapids, I hope you join us for it. Whether you’re here or not, I hope you join me as I learn to stop being an accomplice or an oppressor, keep being an activist, and start being an ally. * The revolution is wearing heels (although not at this very moment) – which is something else I want to write much more about – how we successfully disentangle and own femininity, as feminine people, and how femininity can exist freely and proudly as something other than a means of oppression used by the patriarchy. ** No, Autocorrect, I do not mean ridiculer. For god’s sake, stop oppressing me. *** Seriously, people, Google is a fierce thing and perhaps ultimately a horseman of the apocalypse, but when you Google cisgender, you don’t even have to pick a link to click. The definition is right there on the page in front of your eyes! It’s like magic. Srsly. Also, just as an aside by way of an aside, I don’t care if being called cisgender makes you feel uncomfortable. I’m not angry – if you know me, you know my experience from day to day is predominantly elemental joy. But if you really want to compare your discomfort at having to recognize that you’re not transgender to my having to pretend to be a boy and a man for 38 years, you can just tap on over to another blog. **** Okay, seriously, I have a hard time even finding time for tea… and I’m not so bourgeoisie as all that… she says as she types on her fancy Macbook, leaving a fragrance of ambiguity lingering in the air of this footnote. ***** Because real feminists use diagrams, thus breaking down the gender binary that says that men are visual thinkers and us ladies are verbal / emotive or (more frequently) irrational. Also just because I can. And I give credit to my peep Amanda Niven, from whom I originally learned and subsequently stole this simple but informative model. ****** Careful readers and people who know me well will, at this point, be completely unable to stifle some sort of titter, snort, or open laughter, at the idea of me breaking down the binary, but here we are. Char, I do think Collins’ explanation has the bandwidth to account for a lot of current phenomena. Phenomena like Trans separatism within the LGBT community as a response to LG disengagement from the advocacy side of the LGBT community (or even distancing themselves from the rest of the BTQIA+ for political advantage) as systems of power are less tuned for the purpose of oppressing them in particular. Collins also offers the conceptual model for starting to understand things like animosity between the black church and the LGBT community – I don’t know/remember how far she goes, but to me, that story, to be fully understood, also needs the critical observation that it is a fundamental function of systems of oppression that they strengthen each other, and a fundamental mechanism by which they do this triangulating the target of one SOA against the target of another SOA. Wow what a fascinating post and what an outstanding training to conduct! !